I built me a bicycle. The CSE department at the University of Washington made me do it, unwillingly. Once upon a time, the department was housed in Sieg Hall. While the building wasn't much to look at, my desk sat right next to a window that looked out onto the green HUB lawn. Because the building wasn't much to look at, no one minded my bringing my nice road bike into my office when I commuted to work. I rode my bicycle every day and loved it. Then the department asked and begged and successfully raised oodles of money to build a fancy new building, the Allen Center. Because the building was new and fancy and needed to look pretty so the donors could come by and admire it, bicycles were no longer allowed in the building. There was going to be a bike room. After three weeks of tension during which the department said "don't bring your bike in because there will shortly be a bike room" and I said "but I need to get to work TODAY and my bicycle is the best way to do it and I don't want to leave a $2000 bike outside where we all know theft happens," the bike room opened. We were told the bike room would have a card-entry system, nicely secure because entries could be tracked. Nope, no card system, just a key. We were also told there would be racks inside and, indeed, racks appeared -- flimsy metal, thinner than a cable lock, and attached to the wall by four accessible screws. 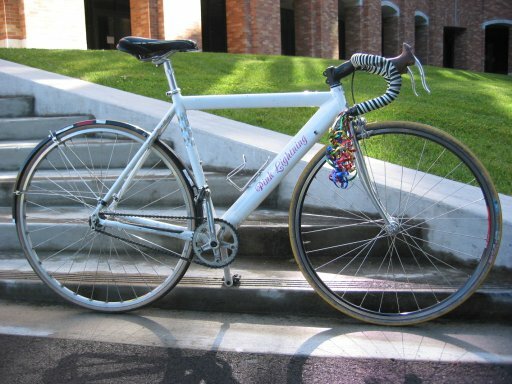 While this is entirely adequate security for a $200 beater, it's not sufficient for a nice $2000 bike. So I had to scramble and get myself a cheap beater and give up communiting on my nice bike. I bought a $130 bike at Recycled Cycles. It turned out to be a total piece of crap with problems that the shop should have noticed and fixed (like tires that didn't fit the rims, and missing rim tape which resulted in several flats). I will never buy a bike from them again, although I do buy used parts there sometimes. Eventually, I got fed up and built Pink Lightning. I received much friendly help from Ti Cycles, my housemate Greg Balco, and the ASUW bike shop in the HUB at the University of Washington. Pink Lightning was originally a fixed gear bicycle with an Eno Eccentric single speed hub because I didn't know any better then and bought a frame with vertical drop-outs. Later that year (2005), I developed some knee issues (unrelated to my fixie) and after surgery switched over to an easier gear ratio and a BMX freewheel hub. After my knee recovered, I flipped the wheel around and ride it as a fixie again. I've moved to California (Sep 2006) and still use it for my commute, now to get a little more exercise on my 5 mile commute than I would on my geared bike.